The Channel Four video has brought forth immense disrepute to Sri Lanka and her people. It has depicted Sri Lanka and its people as brutals. This is an unfortunate situation. There had been worldwide condemnation of Sri Lanka. Based on this video Governments have proclaimed their foreign policy on Sri Lanka (such as the UK and Australia). Sri Lankan Government has vehemently maintained its stand that its forces did not commit such brutal, horrendous crimes and the video is unauthentic. We have shown 58 situations that very clearly show that the Channel Four video is not authentic (please see our previous media releases). The most important finding we highlight is that such a high quality video cannot be produced by using mobile camera videos. Experts have stated that the original videos have been edited to create the final video. It is highly probable that some of the original videos may also have been doctored. Then, many sceneries in the final video are stage managed (produced using Tamil actors etc). Again, please see the 58 deceptions that we identified in our previous write up. Channel Four states it received the videos from a group of ex- Sri Lankan journalists now living in Europe. It is well known that they are an anti-Sri Lankan Government group. Then, this group states it received the videos from various sources such as the Tamil Diaspora and the trophy photos taken by the Sri Lankan Army. Just like the ex- Sri Lankan journalist group, their alleged sources of the videos/photos are also extremely dubious. The world knows that majority of the Tamil Diaspora are working against the Sri Lankan Government. They are promoting the agenda of a terrorist organisation that has been the most brutal in the world. In such a situation, for the whole world to blindly believe in material provided by such a group and/or their allies is most dangerous , risky and foolish. 1 The above is Channel Four’s main promotional slide. The scene very much seems a put-on job. The man lying closer to us is full of bandages all over his body, it is obvious his sole role is to expose all of his bandages well to the camera. He has got blood in his cheek (a weird place to have the wound). They look like dye, not blood. Then, the man who is seated and bent “”…” there is a nicely laid out patch of blood on his bandage. Again the “ƒ”¹…”blood’ more looks like dye. If by any chance, they are real the wounded people (highly unlikely) they could well be terrorists in civil clothes. In the last stages of the war, the terrorists did not wear uniforms, they dressed like civilians. Above is another video. Therein the victims resemble Europeans/Mediterranean “”…” white/olive skin (please watch the whole video again). Could this be a job of electronic editing “”…” ie, they inserted the “ƒ”¹…”Sri Lankan soldier’ into an already existing previous image? However, the view of the majority is that it is a real scene where the Tamil Tigers had executed the Sri Lankan soldiers and now saying it was a job by the Sri Lankan military. The uniform worn by the soldier is not the typical Sri Lankan military uniform. Furthermore, he does not resemble that of a Sri Lankan soldier but a Tamil Tiger (please watch the whole video again). Note the long hair, Sri Lankan soldiers were not allowed to grow such long hair. This shows that there is controversy over the authenticity of this video. Furthermore, this video is of high quality. It was not produced by a mobile phone camera/s. Hence the international world to point blankly believe it as genuine and authentic, and to say it is a situation where the Sri Lankan military was killing Tamil Tigers, is not fair and just. Whatever the real situation of the photo, the crux of the matter is that it is a highly dubious and bogus video. Hence the international world must investigate it thoroughly, before jumping into conclusions. 3. The photos below had lots of prominence during the war where the international media widely published it as a photo depicting the Sri Lankan military shelling the innocent Tamil civilians (women and children). The Sri Lankan Government was blamed for killing innocent civilians. Later it was revealed that the photo was a fake. It had been taken with Tamil actors to deceive the whole world . Some international media accepted it as a fake. It is alleged that some of the actors in this fake photo have appeared in the Channel Four video. However, what was hidden from the world was revealed when the Sri Lankan army later found this in LTTE propaganda material. 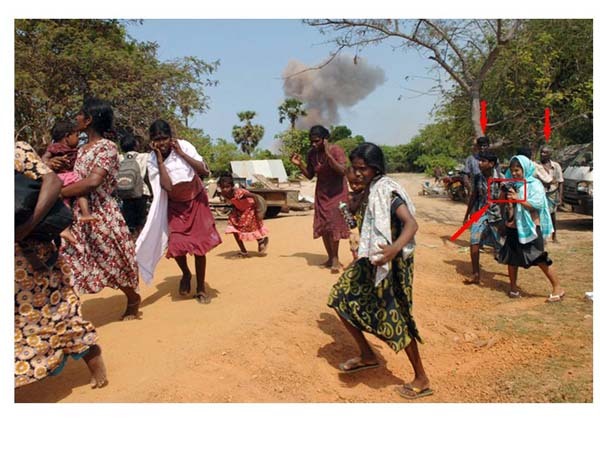 The unedited photo shows that this was a staged LTTE propaganda stunt. Look at the smiling girl with a professional camera and the men who are not affected by the “shelling” in the background. This is how the LTTE used women and children to and act to fool the West. Obviously more than one camera was in operation. 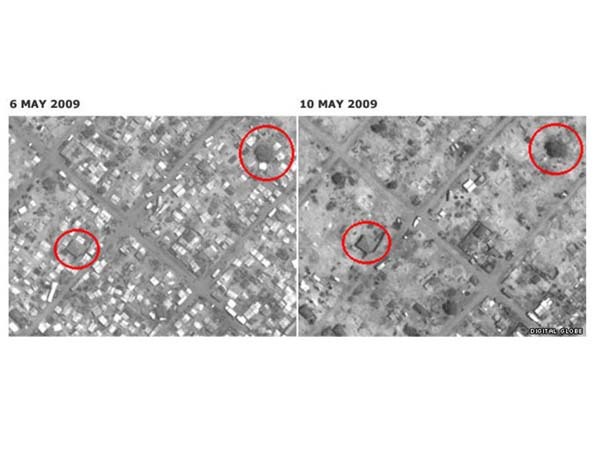 On May 13, 2009, the BBC carried a news item, using satellite imagery, in a further attempt at misleading viewers with images that claim to show an alleged aerial attack by the Sri Lanka Air Force. See pictures below. Above was posted on the BBC website to claim bombardment of the NFZ by the Sri Lankan government forces. Though at a glance it looks like complete devastation, a closer look clearly shows that there is no damage to trees or permanent buildings (a couple circled in red). No signs of aerial attack or artillery fire. The right side image only shows signs of a mass evacuation of the makeshift shelters of the hostages who were herded by the LTTE as a human shield. If SLAF continued widespread bombarding how could the permanent buildings and trees were left intact? This is how the rump LTTE pushes the western media to dupe the world. Thus, in such a situation, the most respectable thing for the Channel Four to do is to submit its video for proper scrutinisation (ABC TV should ask Channel Four to adhere to this). True, the videos were cleared by the UN, but there is a discrepancy in the analysis provided by their expert, Mr Grant Fredericks. According to Mr Fredericks optical zooms had been used in recording the scenes of the video. But it is universally accepted that mobile cameras do not have optical zooms, maximum they have is digital zooms. Nokia 6620, which was the main phone that was allegedly used, definitely did not have optical zoom facility. This inconsistency itself is enough for the international community to demand a full scale investigation of the Channel Four video, but they would not do it. Everyone wants to crucify Sri Lanka, of course for vested reasons. This is not fair and just. If an impartial investigation is not conducted; where the Sri Lankan Government is also allowed to participate and observe, then Channel Four must provide genuine copies of the alleged mobile films to the Sri Lankan Government for the Sri Lankan Government’s own investigation (without them, how can they do such an investigation?). Channel Four may have to reveal their sources (if the matter proceeds to court they will have to do this anyway). It is only by these ways that that an impartial investigation as to the authenticity of the videos can be conducted. If Channel Four and ABC TV, do not do this, and the international community, especially the British Government, would not demand them to do this, it is a clear case of Sri Lanka being denied of natural justice in relation to the most blatant accusations that have been made against it. To satisfy the rules of natural justice, the Channel Four /ABC TV in the documentary should have given the Sri Lankan Government a chance to respond. They did not do this, instead carried out a totally one-sided story. This is a serious breach of the UK/Australian Media Guidelines (the current News of the World controversy shows us how flawed are the UK media ethics, the worst part of it is that Mr David Cameron is also implicated. Mr Cameron now has no moral authority to criticise Sri Lanka, asserting that the Channel Four video is authentic, when it was his own former Communications Chief, Mr Andrew Coulson (now under arrest), who has allegedly masterminded the News of the World telephone hacking scandal. Channel Four and the News of the World are only two examples that demonstrate the sheer hypocrisy of the West – they would allow their journalists to apportion blame on others, even allowing them to stoop to the gutter – innocent Sri Lanka on this occasion where Sri Lanka was not even given a chance to respond in the documentary; they would not investigate such misconduct but praise them! (we have shown 58 deceptions in the Channel Four/ABC TV documentary). The two examples again show that there is so much bad “ƒ”¹…”rubbish’ that ought to be cleared in the Western backyards, before they pick on others, like Sri Lanka. Since exceptionally serious allegations are made against Sri Lanka and its people, the right thing for Channel Four and ABC Four Corners to do especially when Sri Lanka and its people have made a huge cry that the video is unauthentic is to stop telecasting the video, say, at least for 60 days until the authenticity of the video is determined using one or both of the above means. Mr David Cameron should show leadership in this regard (albeit belatedly); just like in the News of the World controversy, he must appoint a full scale enquiry into the Channel Four documentary. If the Channel Four was intentionally, recklessly or negligently televising a fake documentary to the British public and the world at large, then it is a very serious situation. Like the News of the World, action then must be taken against Channel Four. If by any chance the videos are found to be authentic, at least partly, there is no doubt that Sri Lanka will accept the findings and will do everything to catch the culprits and punish them (it is highly unlikely that this is the case, it is obvious that most of the sub-videos in the main video are unauthentic “”…” again, see the 58 deceptions in our previous write up). If Channel Four and ABC Four Corners or the British Government would not agree to this, and continue to denigrate and defame the Sri Lankan people then the only alternative available to the Sri Lankan Government is to initiate legal action against Channel Four and ABC Four Corners, and those who uttered lies against Sri Lanka in the said videos. This will lead to Channel Four and the ABC Four Corners having to pay millions of dollars of compensation to Sri Lanka. The British Media is rotten to the core and stinks. Well done, SLSG Canberra! This irrefutable document MUST be presented by the Sri Lankan government to law-enforcement agencies in the UK and also to Ofcom. Sri Lanka MUST take legal action against ‘channel 4’ and the so called “journalists” for democratic Sri Lanka (JDS), who are the main suspects in dubbing the original video with Sinhalese dialog. This is an essential move that should be done by GoSL, without delay, to ensure no more of these fabrications are carried out by the terrorists. The British media exemplified itself recently with the phone-hacking scandal to show who they really are: just slaves to the likes of Rupert Murdoch, with no moral-principles, and those who’d stoop to the lowest of lows to create an attention-grabbing ‘news item’ that would make them a quick buck. The Defence Secy recently said that, due to the fabricated nature of this video that it will “die a natural death” . But, allowing that to happen is just letting the terrorists and their cronies, scott free. We have the evidence in hand, and we must take these pathetic morons to the court to teach them a lesson they’ll never forget. We are waiting, Sri Lanka. This die a natural death, truth shall prevail stuff are things of the past. We have to fight the propaganda war and beat the losers once and for all. Tigers had a separate unit to photograph/video dramas staged by them. Bloody Tamil Tigers were way ahead of us in propaganda war. The photo of “air attack” and civilians was published in BBC and they apologised and withdrew it when the truth came out. We must go to town with these evidence and discredit these losers. Is it me why is it whenever I do any deep research on any problem that happens in world. It always leads to one country and one city in particular. Britain and London. It seems London is responsible for 90 percent of all the wars, famines, deceptions, evils of the world. Does Satan reside in the City of London by any chance? Just a thought. For example the aboriginal people would still have their country called Australia. Before London 200 years ago decided to have big plans for that land. They have been kicked out of their own land and living as 2nd class citizens lower than the Australians and immigrants who now populate Oz. Still the Aboriginal people are treated poorly by the Australian Govt in Canberra which is an extension London. Because the Queen of England still rules Australia even though Aussies hate to admit it through the Governer General. What happened to Aboriginal people in Australia happened to the Palestinians in Palestine. The British moved in and created through the balfour declaration the State of Isreal. I think I sympathise greatly with the Aboriginal people in Australia and the Palestian people both innocent victims of British Imperialism. Britain the most evil country in the world by extension Australia, New Zealand, Canada, US and Isreal are equally evil as they are British creations and serve British Satanic Interests out of Britain. India trained LTTE is camps in Tamilnadu. India created the killing fields with the help of money raised in countries you named. Why are you crying so much about aborigini people ? British massacred Sinhala people at Wellassa. Dham don’t the Aboriginal people have human rights too? Are they not human beings too?. I am sorry what is your point? You don’t seem to make any sense Sir. Shouldn’t we not cry for all human beings on this planet who suffer as a result of injustice and victims of history? You don’t sound like a true buddhist to me or whatever faith you are more like a Sinhala Chauvinist. Yes British Imperialists Massacred Sinhala people. In the process enslaved Sri Lanka through divide and rule for one hundred fifty years then when they left Sri Lanka they made sure their agents and networks in the Sinhala Oligarchy the Colombo 7 crowd served London’s interests by putting politicians who will be favourable to London. It was terrible. Just one many long list of Crimes the Brits have committed around the world. In its history. Oh you don’t think there Sinhala people who come from families mainly in Colombo 7 who were made wealthy by the British during the Raj they became the Elites of Sri Lankan society. So that when the Brits pulled out of south asia. These people will continue to serve London’s interests that is Buckingham palace and the British foreign office from 1948 to this day! Have you heard of people like Ranil Wickremasinghe, JR Jayawardane etc. You need to open your eyes more mate. There is a lot more going on in this world than you know. So what are you saying that I should cry shed tears only for Sinhala people ONLY? What about tamil people massacred by LTTE? What are the Sinhalese some super race of people only to be shed tears for? Thats no better than the British mentality where they believed that they were some super race of people which gave them in their eyes the justification to conquer the lesser people in other countries. You Sir are bodering very close to a racist mentality a kind of mentality that fuel the fire of conflict in Sri Lanka. Not healthy thinking Dham. Very shameful answer you gave please reconsider you sound like a not very bright person. I would like answer to this. I hope its intelligent because I have very low tolerance to unintelligent answers. Of British Intelligence MI6, American Intelligence CIA, Isreali Intelligence and Indian Intelligence which is where all the LTTE training camps in Tamil Nadu you correctly speak of happened during the 1980s. I know it is fashionable now to blame everything on India right now. Yes India has a lot to Answer. But the the LTTE problem goes a lot deeper than India alone mate. Oh I almost forgot Dham if you don’t believe me here is an article for you to read which can confirm what I wrote above and is not far fetched. Why we have to wait for our government to start the legal actions? Why SLSG Canberra can’t file a legal suit against ABC with this excellent document in hand? This is only way shut Ch4 and ABC down. Tamils have done this legal cases on own their own.. Why can’t we? Tamils have done this legal cases on their own.. Why can’t we? in some order. That burden is now on us Sri Lankans. May the rest of the world help us to do so without further trouble ! I am in my country. I have no knowledge aborigines in Aus. I read what you pointed to. Are you a human rights enthusiast ? Are you in UK ? In that case you must try to help Lanka by bothering your government, picketing, protesting or at least writing a letter to your prime minister like Vajiranana in Australia doing. There is no point writing in length about aborigines is Aus. What I noticed is most ex-srilankans in UK are talking nonsense like Buddhism without Nibbana. Are you going to complain on human rights of our Vedda people ? They are the oldest in habitants and not almost eradicated by us. Why not talk something in current context ? You can fool some of the people some of the time but NOT all the people all of the time. If there is an investigation into the last days of the SL war – the truth will eventualy prevail. WILL GO TO THEIR GRAVE (be it in Sri Lanka or abroad) without an ELAAM. The Ch4 saga continuing while we watch helpessly. There is another “show” to day on Ch4 in UK and this time few of our past “heroes” (or traitors) appearing in the show, including our soldiers from D58. I am sure ABC will do re-broadcast of that too if we don’t file a legal case. The Protest Marches and Media Releases will not work as they will only increase the public awareness of the documentary and unwarranted publicity to ABC. The more we shout about it more people will become aware of this documentary to sympathize with LTTE and its agents. Where is our legal action SRI LANKA SUPPORT GROUP? What is our new HC doing about this while we did the hard work to support his appointment. Where are we going to take legal action against these dubious,one sided so called documentaries? In London and canberra? Can we expect justice from them? especially after what we got from the so called indipendent UN expert panels,UN video expert and indipendent eminant persons panel? If we lose a legal battle there, it will only give credence to all the lies. We must first stop calling them as documentaries as they are not real documentaries but just one sided biased reports. Liers will not submit their fabrications to independent scrutiny. Asking Channel 4 to submit their bogus film will not receive a positive response. After all, earning easy bucks from such fabrications is bread and butter for these nearly bankrupt channels and journalists. Why else do they tour the world with Tamil separatists showing these videos and talking on their behalf? Who is funding their trips? This entry was posted on Tuesday, July 12th, 2011. You can follow any responses to this entry through the RSS 2.0 feed. You can skip to the end and leave a response.